If the surgery is closed, please call the new NHS 111 number. 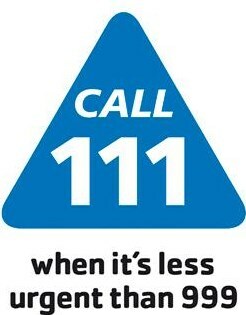 If you need medical help fast, but it's not a life threatening situation you can now call the 111 number. When you call 111, a trained adviser will ask you questions to find out what's wrong, give you medical advice and direct you to someone who can help you, like an out of hours doctor, a community nurse, an emergency dentist or a late-opening chemist. If the adviser thinks your condition is more serious, they will direct you to hospital or send an ambulance. You can call 111 24 hours a day, 365 days a year. The call is free, from landlines and mobiles.